This recipe is a template. All recipes are templates, but especially this one—a sort of "choose your own adventure" for the salad dressing set. That's because what oil and vinegar dressing is when you get right down to it is a particular ratio of oil to vinegar. Which means you can take any oils or vinegars you have available, plug them into the template, and have it come out right. The same goes for the seasonings—salt and pepper are essential (see the note below), but beyond that you can add a pinch of garlic powder, some dried parsley, whatever you have on hand. Just don't overdo it, and keep it to two or three (not counting salt and pepper). So, the ratio is three to one: three parts oil to one part vinegar. This formula will work 100 percent of the time, but that doesn't mean it will be perfect 100 percent of the time. It's a rough guideline. You'll have to tweak it to make it perfect. Not every vinegar is the same strength, for one thing. And of course, people's tastes vary. Place all the ingredients in a glass jar, tighten the lid and shake vigorously for about 10 seconds or until fully combined. Let stand for 30 minutes at room temperature to let the flavors meld. Give the dressing a good whisk immediately before serving. When experimenting with flavor combinations, be sure to taste and adjust as you go. A good way to taste is by dipping a piece of lettuce, rather than tasting the dressing on its own. A teaspoon of honey or mustard will not only add flavor; it will also help stabilize the emulsion, so the dressing won't separate as quickly. 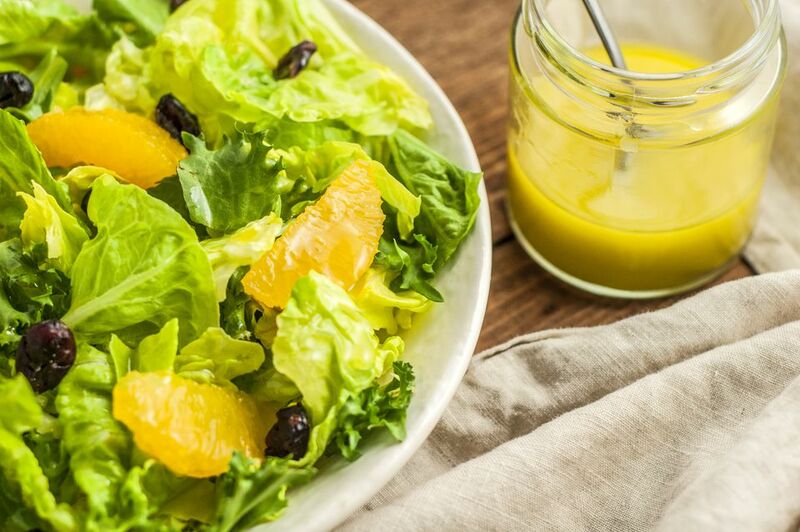 A squeeze of citrus, like lemon, lime, orange, or blood orange could be a nice addition. Kosher salt and freshly ground black pepper are the best. Those little boxes of ground pepper are 90 percent stale before you even get them home. This recipe calls for salad oil, which means anything from safflower oil to canola oil to soybean oil. You could, of course, use something with a bit more of a distinctive flavor, such as walnut oil or avocado oil or olive oil. Grapeseed oil is lovely if you can afford it. While this recipe calls for white wine vinegar, other kinds of vinegar can add flavor. White wine vinegar is perfectly adequate, and red wine vinegar is even nicer. Balsamic is terrific and will take you in a whole different direction. The only thing you should stay entirely away from is plain distilled white vinegar, which is good for household cleaning but not so much for salad dressings.